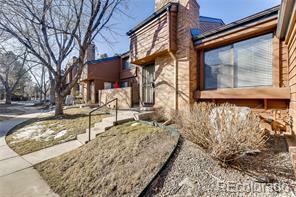 Great opportunity to own this a amazing town home! Vaulted Ceilings and a fireplace create a open main floor plan with plenty of natural light. Updated kitchen, newer appliances and flooring as well as a perfect office area that looks out to your front patio. Beautiful mature trees and professional landscaping . Large Master bedroom with a big soaking tub and lots of closet space. Partially finished basement with plenty of space to grow. End unit with the High line canal and Kennedy Golf coarse just steps away! Garage #138 Don't miss this opportunity.